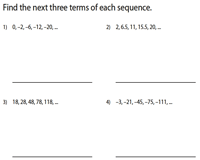 High Schoolers can achieve optimal learning with these general sequence worksheets that cover the absolute basics of sequencing. Split into sub topics, each dealing with acquiring a specific skill - like spotting arithmetic and geometric sequences, appending to a given sequence, plugging the missing term in a sequence, writing the sequence for a general term and more. The goal here is to figure out if the given sequence is arithmetic, geometric or neither of them. 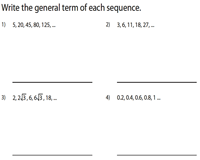 In this set of worksheets, all you have to do is keenly observe the sequence, study the pattern and then append the next few terms of the sequence. 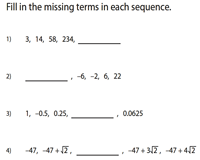 General sequence worksheets provided here are packed with exercises to figure out the pattern in the given sequence and plug in the missing terms. 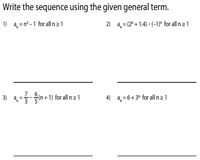 The worksheets here concentrate on finding the sequence when the general term is given. Substitute the values of 'n' in the general term to form the sequence. 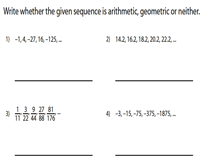 Each worksheet contains eight questions on finding the general term of the sequence and two questions on finding the specific term.